We are interested in a diversity of topics at the intersection of ecology and evolution, with a special focus on fungal biology. Our work in mycology reaches across boundaries with respect to microbiology, plant pathology, genomics, functional traits analysis, and phylogenetics. Here are some of our active projects and ongoing interests. Plants and fungi share an ancient coexistence that dates to the earliest colonization of land. Plant-fungal interactions can labile, and life history strategies of plant-associated fungi can change over ecologically relevant timescales. (1) With Drs. Naupaka Zimmerman (University of San Francisco) and Posy Busby (Oregon State University), we are using fungal endophytes as models to explore these transitions. Using pathogenic and endophytic Mycosphaerella that affect the model tree Populus trichocarpa, this work combines greenhouse experiments and metatranscriptomics with the conceptual tools of functional and comparative genomics. (2) We are collaborating with Drs. Jana U'Ren (UA) and Jen Wisecaver (Purdue) to study the phylogenomics and genetic underpinnings of the saprotroph-endophyte continuum, with a focus on Xylaria and related fungi. (3) With Drs. Sunshine Van Bael (Tulane University) and Joe Wright and Kaoru Kitajima (STRI) we are examining how functional traits of leaves and fungi define endophyte community structure and plant ecology in tropical forests. Contact us for more information. We are interested in how a changing environment effects the fungal communities that are integrally linked with their hosts. 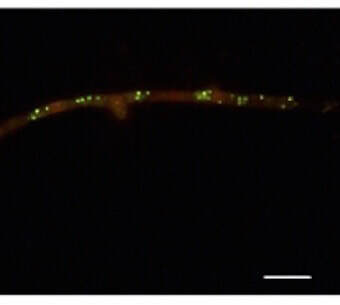 (1) One project, led by NSF GRFP Fellow Liz Bowman, investigates how foliar fungal endophytes and ectomycorrhizal fungi associated with Pinus ponderosa are affected by climate change: how is each partner, and their interaction, affected by abiotic stresses? (2) A related project led by PhD student Yu-Ling Huang focuses on the effects of wildfire on endophyte communities in two economically and ecologically important tree species (Quercus hypoleucoides and Juniperus deppeana) in southern Arizona. (3) A third project focuses on discovering and translating the microbiome of arid-land plants. Many wild plants in the desert southwest are closely related to crop species, and flourish in marginal and degraded landscapes. (4) With collaborators, graduate students Emma Woytenko, Aasiya Hamzazai, and Ashton Leo are evaluating the diversity and potential applications of these arid-land microbiomes. (5) Through this initiative, our focus on invaded plant communities is led by MS student and high school teacher Gavin Lehr, who engages students in his study of fungal symbionts of Lehmann's lovegrass in the Santa Rita Experimental Range. Contact us for more information. Endophytes are increasingly recognized as a trove of biochemical richness, often yielding novel compounds and pharmaceutically or industrially important metabolites. We are collaborating on four projects that focus on natural product chemistry, with team members based at UA, Mississippi State, Zagaya/Berkeley, the Smithsonian Tropical Research Institute, and the Universidad de Panamá, with the goal of identifying bioactive fungi in deserts, diverse temperate and boreal environments, and tropical forests. Our targets include breast cancer, prostate cancer, antibiotic-resistant bacteria, agricultural pests, and the causal agents of malaria, leishmaniasis, and Chagas' disease. Through this work, we are evaluating ecological distributions of endophytes and other fungi associated with plant parts such as cactus spines and tree thorns, often through citizen-scientist workshops and outreach to high school students. In our lab we are fortunate to host Dr. Joe Spraker, a postdoc studying interkingdom communication and fungal secondary metabolites. Fungal endophytes are abundant and diverse in leaves of tropical trees, but the scale of their diversity is unclear: disparate studies are generally not comparable due to differences in endophyte isolation methods and fungal species concepts. Accordingly, beta diversity of tropical endophytes remains unknown, and the degree to which different ecological or geographic factors shape endophyte communities has not been examined. With the development of the network of Forest Dynamics plots through the Center for Tropical Forest Science, we have a critical tool for coherent studies of alpha diversity at multiple sites; for explicit examination of beta diversity among sites; and for hypothesis testing with regard to the importance of forest diversity, host plant frequency, and abiotic factors such as precipitation in shaping host-endophyte associations. Fungal endophytes are ubiquitous among terrestrial plants, can confer significant ecological benefits on their hosts, are closely related to pathogens, and move across borders during plant introductions. However, little is known regarding their diversity and species composition in most host plants, and their cryptic roles in facilitating invasion by the plants that harbor them have not been explored. With Dine College, the college of the Navajo Nation, we work in one of the most dramatic landscapes in the arid west: the Colorado Plateau, with a special focus on plants and lichens -- and training in microbiology -- within Diné Bikéyah (the Navajo homeland). In collaboration with Dr. Stacey Weiss and her students at the University of Puget Sound, we are investigating the microbial ecology of lizards. In a multi-year project based largely at the Southwestern Research Station in Portal, Arizona, Stacey and her team are testing the hypothesis that beneficial cloacal microbes are passively transferred to eggshells and provide eggs with protection from fungal pathogens. Our focal species is the striped plateau lizard, Sceloporus virgatus, which lay eggs in soil burrows at the beginning of the summer monsoon season, and provide no parental care during the two month incubation period. We are delighted to be embarking on this new collaboration (Apr 2018! ).